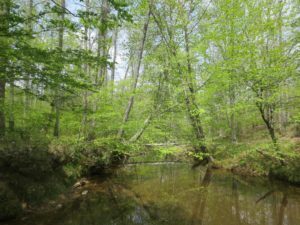 A partnership between a local land trust, state and municipal water quality programs, and the Army National Guard has led to the permanent protection of 127 acres adjoining Camp Butner. The property is located in Granville County on Camp Butner’s northern boundary. Tar River Land Conservancy (TRLC) purchased the property from Mr. and Mrs. Raymond A. Jones of Morehead City, NC. 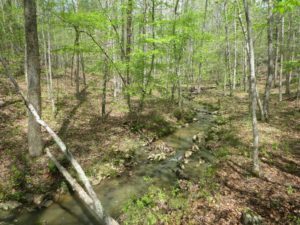 The Jones Tract is the second undeveloped tract of land adjoining Camp Butner that TRLC has acquired since 2017. The Jones Tract is located upstream of two drinking water reservoirs, Lake Holt and Falls Lake. Lake Holt supplies drinking water to Butner, Creedmoor, and Stem. Falls Lake supplies drinking water to Raleigh and other Wake County communities. Hardwood trees buffer 1.5 miles of streams that flow through the property. TRLC’s purchase of the Jones property will ensure that it remains permanently undeveloped and forested. The Jones Tract was owned by the federal government during World War II as part of Camp Butner, an Army installation created in 1942. Most of Camp Butner was sold by the federal government in the early 1950s. The North Carolina Army National Guard continues to manage 4,900 acres of Camp Butner for military training. The Jones Tract shares a half mile of boundary with the present-day Camp Butner. TRLC raised funds for the Jones Tract conservation project from three funding partners, $95,100 from the National Guard’s Army Compatible Use Buffer program, $156,000 from the North Carolina Clean Water Management Trust Fund, and $212,750 from the City of Raleigh’s Watershed Protection Program. The funds raised for the project covered a number of project costs, including the price of the land, transactional costs, endowments for managing and monitoring the property, and the removal of an abandoned structure. TRLC will develop a Forest Stewardship Plan for the Jones Tract to guide its management activities. Stewardship objectives will include improving habitat for non-game wildlife species and promoting diversity of native plant communities. Like dozens of privately-owned properties that were once part of Camp Butner, the US Army Corps of Engineers believes that undetonated military shells and rounds could still be present underground on the Jones Tract. As a safety precaution, the public will only be allowed to visit the Jones Tract during scheduled hikes led by TRLC staff members. TRLC expects to offer a guided hike on the Jones Tract in 2019. To receive future announcements about TRLC’s guided hikes, please send an email with your contact information to events@tarriver.org. Tar River Land Conservancy is a nationally-accredited land trust that works to preserve the natural resources across an eight-county region of North Carolina – Edgecombe, Franklin, Granville, Halifax, Nash, Person, Vance, and Warren Counties. Since 2000, Tar River Land Conservancy has protected 20,080 acres of land and 167 miles of streams. The Army National Guard’s Army Compatible Use Buffer program works with partners to ensure its military mission is protected on post from incompatible development off post. Funds for the Jones Tract project were awarded by the National Guard Bureau and the Department of Defense’s Readiness and Environmental Protection Integration program. For more information about this program, please visit www.repi.mil and www.aec.army.mil. The City of Raleigh’s Watershed Protection Program provides grants to land trusts and local governments to protect and enhance the City’s drinking water resources though land acquisitions, planning, and innovative water quality improvement activities. The program is funded through a usage based fee assessed to all of Raleigh’s water customers. To learn more about the Raleigh’s Watershed Protection Program, please contact Edward Buchan at edward.buchan@raleighnc.gov or 919-996-3471. Established in 1996, the N.C. Clean Water Management Trust Fund awards grants to protect land for natural, historical and cultural benefit, to limit encroachment on military installations, to restore degraded streams, and to develop and improve stormwater treatment technology. For more information, please visit www.cwmtf.nc.gov.